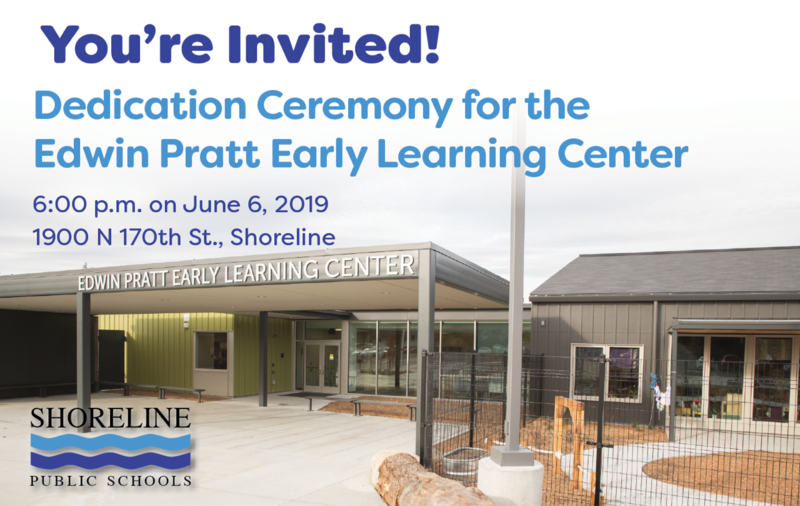 Shoreline Public Schools is inviting the community to attend the dedication ceremony and open house for the Edwin Pratt Early Learning Center, 1900 N 170th St, on Thursday, June 6 at 6pm. Tours of the school will be available. The Edwin Pratt Early Learning Center opened its doors to 400 of Shoreline Public Schools’ youngest learners on Monday, January 7, 2019. The new 55,000 square foot facility at 1900 N 170th St. is now home to all of the school district’s preschool programs. Those programs include Shoreline Children’s Center tuition-based preschool, Head Start and Early Childhood Education. The open, bright and modern spaces are a big change from the Shoreline Children’s Center that was originally built in 1957. The original building was home to Meridian Elementary until it became the Shoreline Children’s Center in 1985. The total estimated cost for design and construction of the Edwin Pratt Early Learning Center is $35,800,000. The architect for the project is Mahlum Architects and the contractor is BNBuilders.